A Book Review of Stanly Johny’s The ISIS Caliphate: From Syria to the doorsteps of India. yria is broken. We all are,” says one of Stanly Johny’s interviewees in his recent book The ISIS Caliphate. A people suffocated not just by its own “ruthless” dictator, but also caught between two powerful imperialist forces, Syrians has witnessed very harsh and unstable times. Recently, this troubled landscape has also witnessed the growth and subsequent decline of a serious terrorist formation – the Islamic State. Stanly writes: “Be it in Afghanistan, Iraq or Syria, extremists love chaos”. 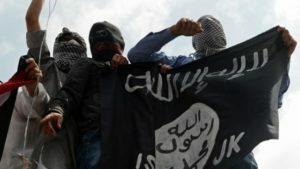 Following the meteoric rise of the ISIS in the recent past, their spectacular means of terror as well as their strategies of recruitment have received much public attention. Much of the written word that has resulted from this attention have tended to be clouded by vulgar forms of fear or hatred. There is a dearth in literature, particularly from South Asia, that analyses the precise socioeconomic, political and religious conditions that underpin the formations of this terror outfit. Here, Stanly Johny’s The ISIS Caliphate is an original intervention, one that speaks simultaneously to academics and non-academics, in clear and lucid terms. For me, Stanly makes three arguments. One, he submits that ISIS must be examined as an original force, and not as yet another crude replication of the previously familiar terror outfits. Two, he demonstrates that ISIS is the fourth Wahhabi state in history. Three, he uses a core-periphery model to mark the relations between ISIS as it operates in Syria and Iraq, as opposed to its operations in more distant places, such as Europe, Canada or Kerala. In the light of these arguments, we are challenged to re-consider the potency of solely militaristic interventions as a means to organizationally deplete the ideological formation that ISIS represents. The book itself is broadly divided into two sections – The Core and The Periphery. All three arguments are compelling, and convincingly presented with evidence from both the archives as well as his own field interviews in Jordan and Kerala. In The Core, Stanly begins by positioning the emergence of ISIS within a broad and truncated history that starts with the abolition of the Ottoman Empire, and leads up to the present day. He patiently takes us through the failures of the 20thcentury attempts at establishing a Caliphate, the formation of al-Qaeda, and the influences of larger geopolitical events on the Syrian landscape…resulting finally in the emergence of Abu Bakr al-Baghdadi, and “the revival of a medieval idea” of Islamic unification with the declaration of the Islamic Caliphate. Needless to say, as an outsider to nuances of this territorial history, I found the introductory chapters helpful. He then proceeds to introduce ISIS not just as a formal terror outfit, but as an ideological formation in itself. In lucid language, Stanly takes us through the history of the religiously exclusivist political ideology of Wahhabism, one that began in 1744 with “an alliance of convenience, between a fugitive cleric and an ambitious tribal chieftain” – Abd al-Wahhab and Muhammed bin Saud. Here, I was impressed by the clear and materialist history that explains the fate of the first three Wahhabi states within a context of socioeconomic conflicts, the plundering of valuables, and the eventual discovery of oil reserves. This history, one that leads into Stanly’s positioning of ISIS as the fourth Wahhabi state, is particularly convincing. The book proceeds to shift attention towards the operation of this ideological formation elsewhere, in his section on The Periphery. Here, he takes us through the strategies of global recruitment and war tactics that ISIS has come to employ, as well as the position of South Asia within these strategies. He draws our attention towards a more specific history of Salafism in Kerala, attending to its early reformist history as well the more contemporary ultra-puritanical manifestation. What makes a youth, far away from Syria, living in relative luxury and exercising religious freedom, so susceptible to the idea of ISIS? How did the Islamic state capture the imagination of young people far away from Syria? Here, his sources are rich, ranging from the president of KNM (Kerala Nadvathul Mujahideen), intelligence officials, experts on Islamic History in Kerala, and so on. This section is particularly original, and I would not rather explain away the whole content, as it is perhaps best written by Stanly himself. My major issue with the book is about its proof-reading which I feel could have been more rigorous. Occasionally, there are some confusing punctuations, irregular capitalizations (upper-case/lower-case) and an inconsistent spelling of names which hinder an otherwise smooth reading experience. At one point, the content of a pamphlet by ISIS was not presented in quotes and as separate from Stanly’s own writing, creating a momentary confusion. With regard to the content itself, with a caveat about my own limited knowledge, I have only one recommendation. Stanly does argue early on that conventionally objective arguments about imperialist military intervention, material impoverishment and structural discrimination are insufficient in explaining the emergence of ISIS. This is the reason he turns to Wahhabism as a political ideology, and the subjective, religio-spiritual role it plays in recruiting members to ISIS. This is clearly the case in ‘the periphery’, as Stanly shows that many of the recruits from Kerala are from relatively well-off economic backgrounds. But the history of ISIS in ‘the core’ itself could perhaps have benefited with some elements of an objective, structural analysis. However, considering that the book is an attempt to move away from traditional forms of terror analysis, this recommendation could well be outside of its scope. In closing, I wish to add that it would also be useful to think of the core-periphery model of action as a more general model that is made possible today by the transnational flows of finance, ICT & transport technologies. In this capacity, this analytical frame can expand in usefulness beyond the ISIS. It could offer a basic, skeletal model to think about how territory-based movements navigate a scale that is global in nature under late capitalism. I rate this book 4/5, for its success in developing its arguments from the basics, its accessibility without compromise on complexity, and Stanly’s clear analysis and argumentation. A must read. THE ISIS CALIIPHATE: From Syria to the doorsteps of India, Author: Stanly Johny; Published by: Bloomsbury India; 184 Pages; Price: Rs. 449.